Last fall we helped HP introduce HP Pack Ready for Labels, a fast and easy solution for creating very durable labels that can stand up to all sorts of conditions. By simply adding the Michelman DigiGuard 901 OPV Strengthener additive to a silicone-free OPV, such as KustomLP 200 Gloss or 405 Matte, you can achieve high-resistance labels that open up new market opportunities for HP Indigo printers. In January, we printed a new batch of labels to test using the Sutherland Rub Test and tape tests that are industry-standard tests for durability. We digitally printed standard white, clear and metallized BOPP labels on an HP Indigo 6800 Press. Then, we mixed batches of DigiGuard 901 with our KKLP 200 Gloss and KKLP 405 Matte Overprint Varnish in a radio of 9 parts OPV and 1 part 901, as instructed by the HP Pack Ready for Labels process. After a couple of days, we immersed the labels in hot water and chemicals for tests ranging from 2 to 8 hours, and then applied the Sutherland Rub Tester for 1,000 rubs with 2 pounds of pressure, at 21 cycles a minute. After these vigorous tests, we saw no visible change to the labels. Check out the video above to see how we did it! Plus, if you’re at Dscoop Edge in Orlando, we’ll have HP Pack Ready for Labels samples in booth #305, or visit our Contact Us page to request a sample. See you in Orlando! S-One Labels & Packaging is excited to announce its expansion into the EMEA region, as of Nov. 5, 2018. Effective immediately, all orders that were processed through BMG Media Source will now be handled by S-OneLP. In addition to offering products like Michelman’s DigiPrime and DigiGuard in select countries, S-OneLP EMEA will present a growing list of products for digital printing of customized labels and flexible packaging, including over-print varnishes, coatings, additives and films to the entire EMEA region. As with the S-OneLP business in the Americas, S-OneLP EMEA will pair relevant products with unparalleled service, technical know-how and integrated solutions with a highly experienced team based in the region. An immediate benefit in logistics is that we are moving from the BMG media warehouse in Saint Witz, France to Nijmegen, Netherlands. This will drastically shorten lead times and improve service. This new warehouse also enables us to carry other chemistries besides water-based products. This expansion responds to the ever-increasing demand for new innovative label solutions and for digital printers to integrate into providing customized and shorter runs of flexible packaging to their brand customers. To contact the S-OneLP EMEA team, email: labelsandpackagingEMEA@sone.com. About S-One Labels & Packaging: S-One Labels & Packaging is a division of S-One Holdings Corporation, the parent company of LexJet and Brand Management Group. 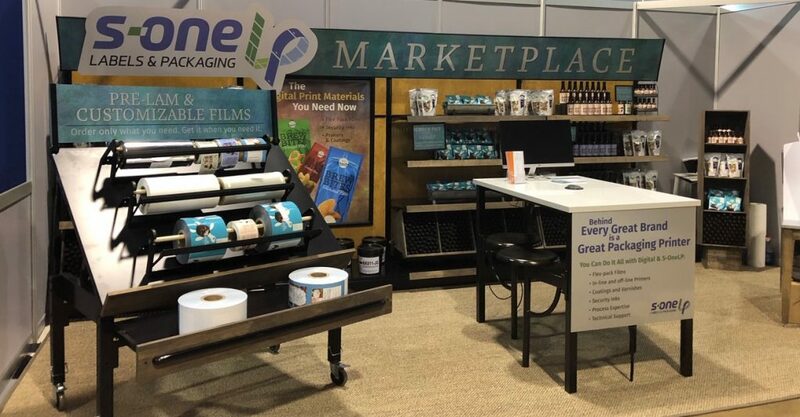 This division provides materials, technical know-how and integrated solutions to print providers who are currently active or expanding into label and flexible packaging digital printing. Founded in 1994 and headquartered in Sarasota, Fla., S-One provides innovative product research, development, manufacturing and worldwide distribution to digital imaging, design and print professionals. Visit S-One Labels & Packaging at S-OneLP.com. If you’re looking to produce labels durable enough to pass heat, chemical and water-resistance testing, S-OneLP is now offering Michelman DigiGuard 901 OPV Strengthener as part of HP’s Pack Ready for Labels solution. Creating pressure-sensitive durable labels for cosmetics, household cleaners, auto chemicals, food, beverages and more, is now easy to achieve if you operate the HP Indigo 20000 Digital Press, HP Indigo WS6000 Series Digital Presses, and the HP Indigo 8000 Digital Press with inline priming units. The new DigiGuard 901 OPV Strengthener is a simple and cost-effective mix-in additive that can open HP Indigo digital print service providers to new markets using the equipment you already own. In the video above, HP introduces a solution that will increase the durability and resistance of labels using the new DigiGuard 901 OPV Strengthener, which is mixed with a standard varnish. After printing labels on an HP Indigo press, we chose a KustomLP gloss varnish, available exclusively at S-OneLP, which produced exceptionally durable results, according HP Solutions Architects during the testing process. To learn more about creating durable labels, and the best products for the job, give us a call at 941-256-7900, email us at labelsandpackaging@sone.com or visit our Contact page. Let’s cut to the chase: There are just too many choices in flexible packaging design. In conventional converting/flexographic printing, you need to ask: Which substrate/sealant combination will work best for my application? Which adhesive system? How do we know when it’s fully cured? Do we have all the materials lined up, the flexo plates made and time available on the both the press and adhesive laminator? Will the package look good while having the protective barrier needed to assure the product stays intact and fresh? It’s a headache. Since you asked … first, I’d avoid the flexo process altogether and go with a digital press. Then I’d buy a pre-fabricated structure that’s suitable for the pouch contents (food-safe, for example) in which the webs have already been laminated and fully cured. I’d sleep well knowing that the structure was chosen for its suitability for the application I have in mind, and all I’d need to do is upload artwork, put the pre-laminate on a digital press and make roll stock. Here are steps to choosing the best pre-laminate. What is the product to be packaged? What package format, e.g. pouch, sachet or stick pack or flow wrap? Does the package need to be clear, silver or white? For example, I want to make 1,000 packages for an order of sugar cookies on a horizontal flow wrap machine and the entire web will be printed. I would choose Protect-all 2mil Snack Web – White (PPC2000W), a food compliant, polyester//white sealant pre-laminate with overall thickness of 2.0 mils. Why white? Because a white background makes colors pop. Run the pre-laminate through the digital press, top with a water based OPV such as Michelman DigiGuard Gloss 115, wind it up and send the roll to the co-packer for horizontal form, fill and seal (HFFS) packaging. Once you know the right pre-lam to choose for the contents, the rest is a piece of cake. Ready to get started? Call S-OneLP at 941-256-7900 or email labelsandpackaging@sone.com to request a sample of a printed and OPV finished pre-lam pouch and learn about other packaging possibilities available from S-OneLP. DON’T MISS our upcoming blogs for more tips on food safety and the flexible packaging printing processes.